Don’t you just hate it when you make bad food decisions? I know it’s a #firstworldproblem but in the small world of restaurant experience, I find it hard to deal with. 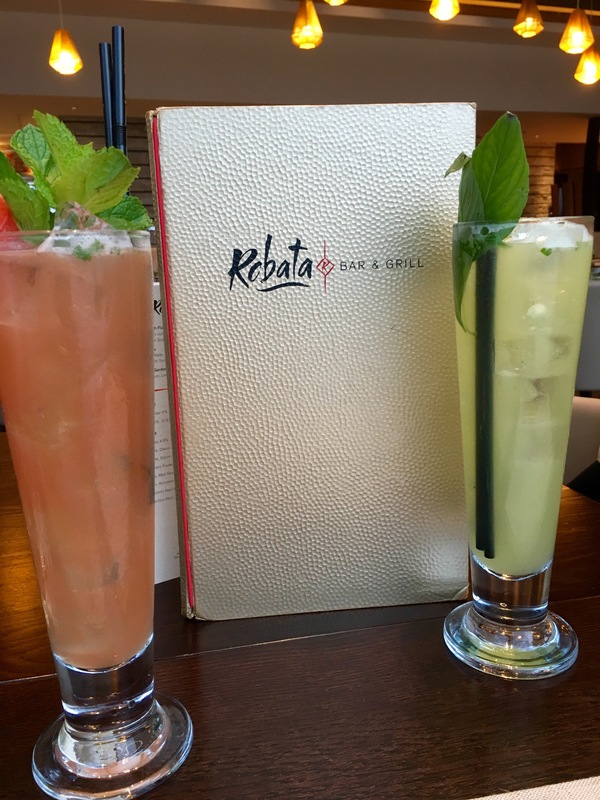 It’s no secret that I love Robata Bar & Grill @ Resorts World Birmingham so you can imagine how excited I was to try their shiny new menu. On this occasion, a fellow Robata buddy and I were having a joint birthday celebration so cocktails were in order: Thai Basil Cooler for her (right) and Bitter Summer for me. Robata’s new menu now includes two deluxe sharing main courses: Singapore chilli sharing crab served with crispy rolls and the big winner of the new menu, a 1kg Tomahawk Steak served with a choice of 2 sides. Sounds good right? Yeah. We didn’t go for either of them… You’re joking? Sadly, no. At the time, there were too many other options taking our fancy. 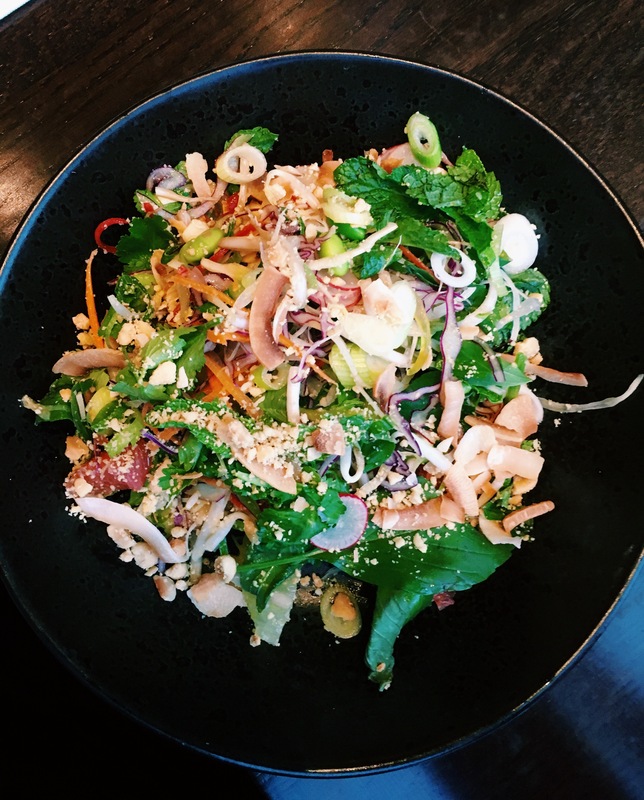 We started with salt & pepper squid with spicy mayo for Sarah and a fresh Thai Super Salad with a peanut and coconut dressing for me. 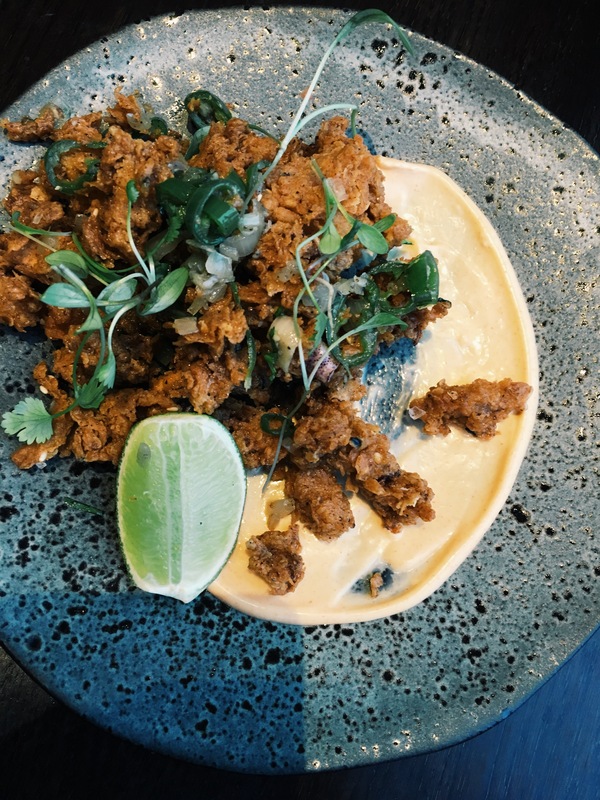 Both fairly light and refreshing starters – Sarah’s light on the quantity of squid to batter – still fairly yum – and mine refreshing and full of fresh Thai herbs, loads of toasted peanut/coconut and mixed grapefuits too – yum. For main, I was between two of their new fish courses, Barramundi & Red Snapper. 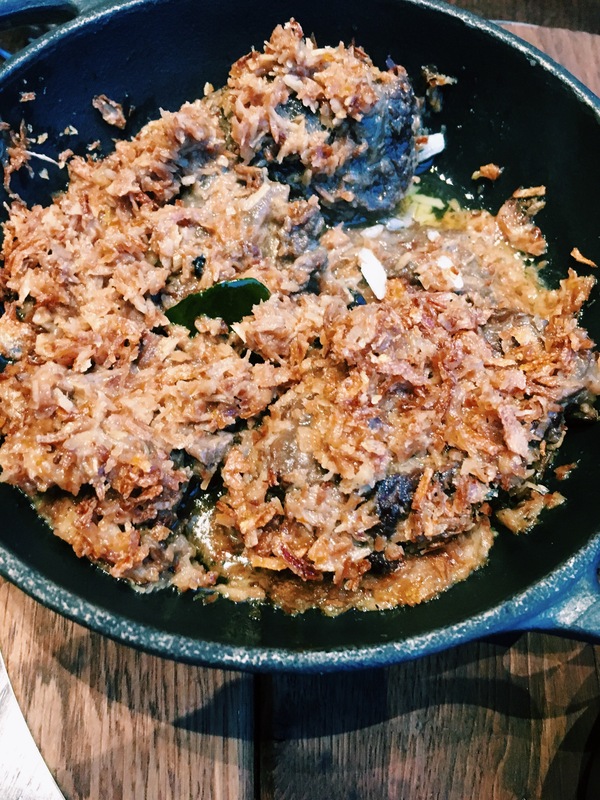 Somehow, however, again I opted for neither of these and went for the Beef Cheek Rendang… This is a different twist on the Korean Beef Cheek dish from the former menu, a previous fave. My curry knowledge clearly failed me here however. 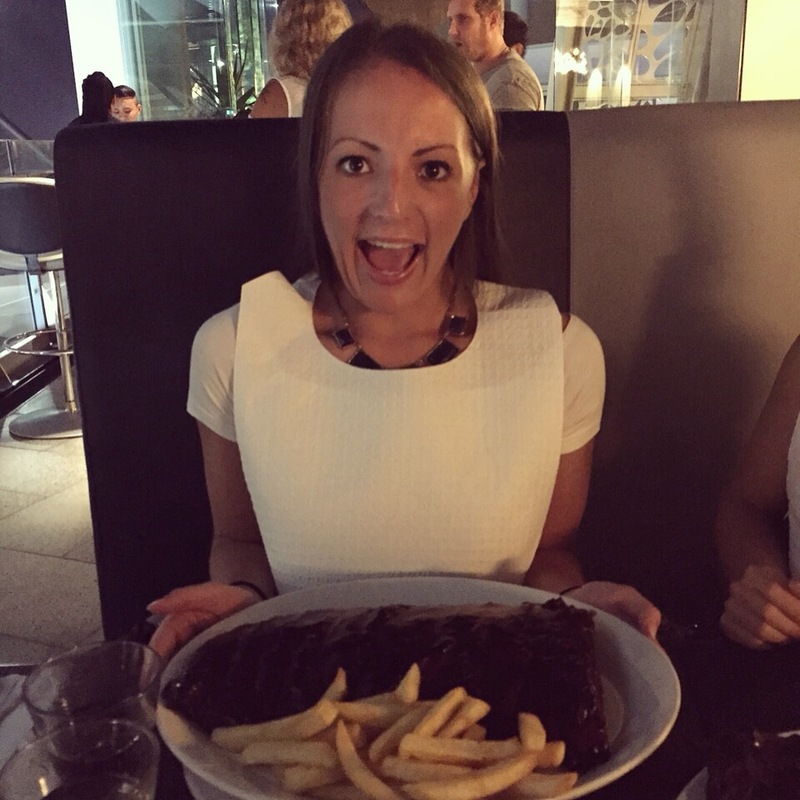 I did ask our waiter, the very attentive and friendly Christian, to clarify if it was a ‘saucy’ curry – he said yes. I didn’t doubt him (bad foodie). Saucy, it was not. Fairly dry and piled too high with masses of fried coconut and seemingly nothing else, it was. The spicy sambal on the side, whilst very nice along with the sticky rice, was the only alternative flavour. Unfortunately, this all became a bit too sweet for me, the coconut overpowering any other flavour in the dish. Whilst the beef cheek was also piled equally as high, it was almost too much and possibly a little under done for such a fatty meat, it didn’t fall apart as much as I’d have liked. I had to leave about a third 😦 (unheard of). Sarah also went against her better judgement and opted for the Pad Thai with crispy tofu & chicken, a continued choice on the menu. 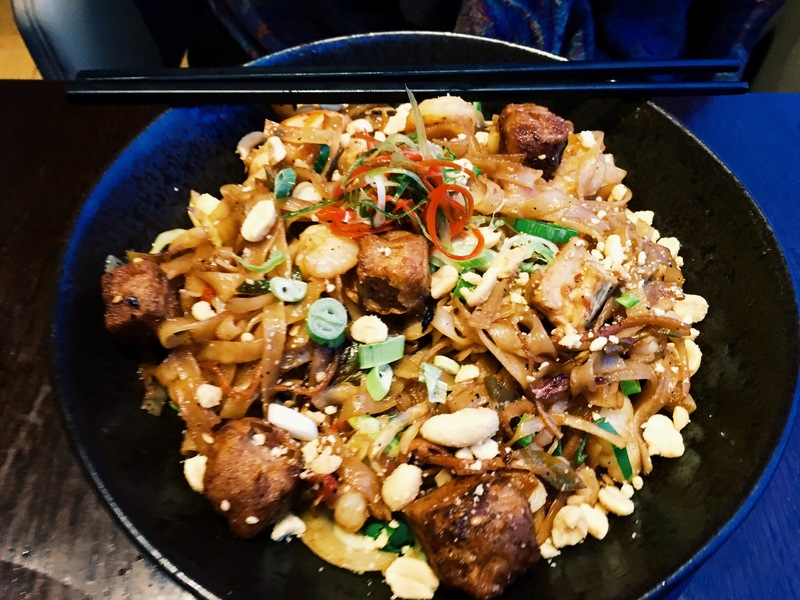 As noted in my previous post, this Pad Thai does have a fair whack of chilli in compared to the traditional mild Thai recipe, so be prepared if spicy’s not your thing. Also don’t be afraid of be tofu. It’s battered and barely recognisable. But it’s a hearty, tasty portion on the whole and Sarah liked it a lot. However, despite #menuchoicefails, we MORE than made up for it in our choice of shared dessert! 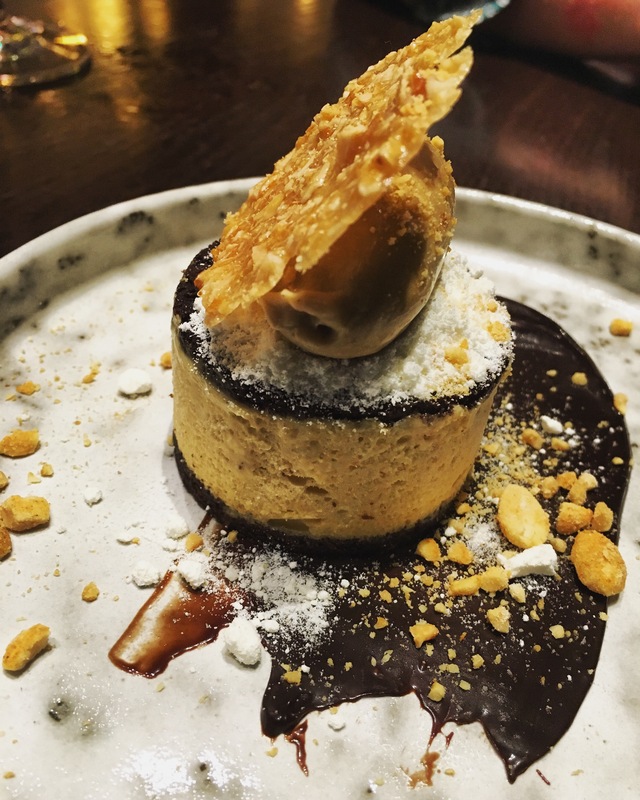 Peanut chocolate parfait with dulce de leche, peanut brittle and toasted peanuts. Everything about this was exquisite. The separate elements, doubled up, all of them together, though the dulce de leche and peanut brittle were particularly marvellous; creamy, caramelly and cruncy, in their respective palates. It really was the icing on the cake (parfait). 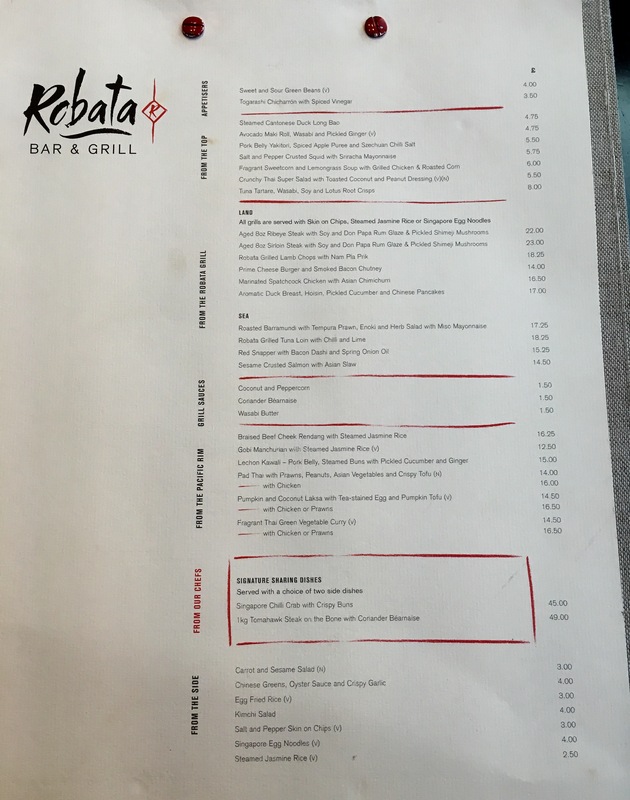 Robata appear to have done away with core parts of their initial menu, including the selection of skewer dishes previously available in both meat and fish varieties. Whilst this is a shame, the rest of the menu looks divine in itself to avoid missing these options. It’s definitely not a disappointment. My biggest to note to self and audience: if you’re going to try Robata’s new menu, stick to the fish or the meat, as the team of chefs have always done this really well. Why I didn’t take my own advice on the night, I do not know. Do this, or go for the big ones, Singapore crab or Tomahawk. I know I’ll be doing the same on my next visit. (Btw, service, speed and ambience as good as ever; they were not aware I was dining and consequently blogging).